After an all too brief gig at the job I got in January, I find myself again unemployed. I can console myself knowing that the termination was budget motivated and not due to poor performance on my part. Simply the bad luck of being the New Guy when the ax needed to fall. Job-hunting is an unpleasant task, though being unemployed in July has its advantages. Reena had three days in a row off, and I have all sorts of free time at the moment. 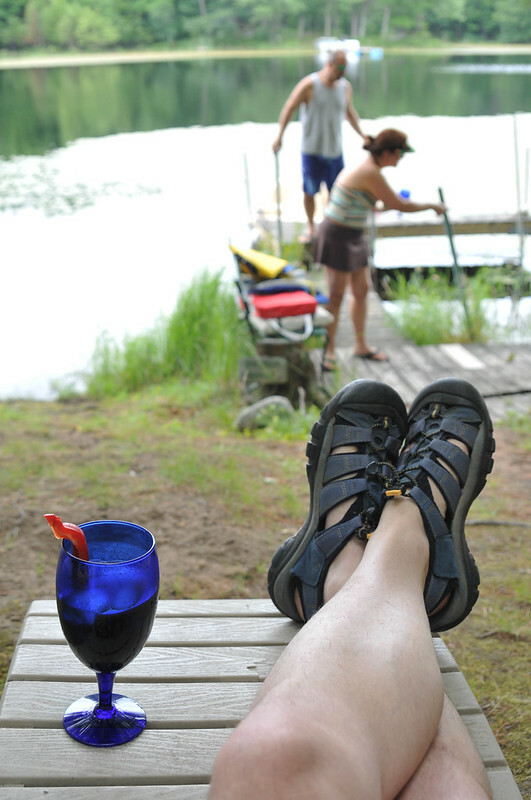 So when her younger sister called and invited us up to visit at their cabin in the northern part of the state, we juggled some minor obligations, secured a cat-sitter, and whooshed three and a half hours north to spend a few days chillin' on a pair of small lakes. There was no agenda. There was plenty of cold beer, an array of suitable foods and snacks, weather that ranged from hot and sunny to cool and rainy (in the span of about an hour! ), and loads of good conversation. 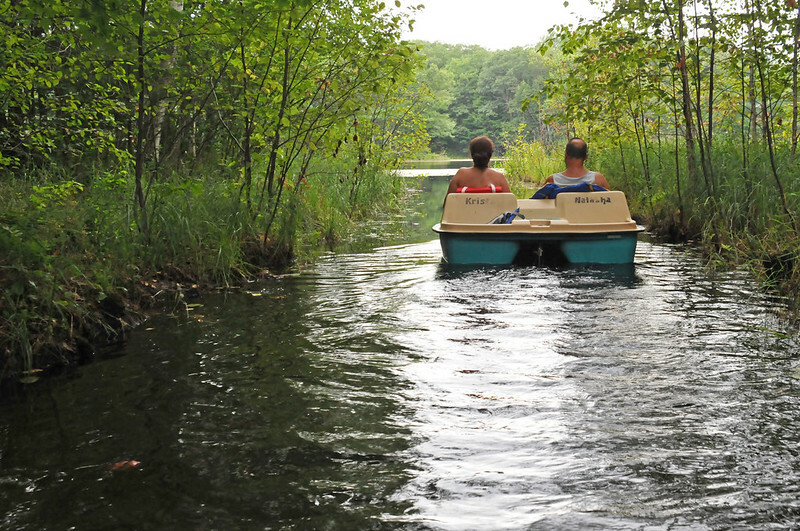 Plus we got to toodle around the small lake in paddle boats while our gracious hosts showed us the sites, a sure way to remind yourself to slow down. Feels like the African Queen! 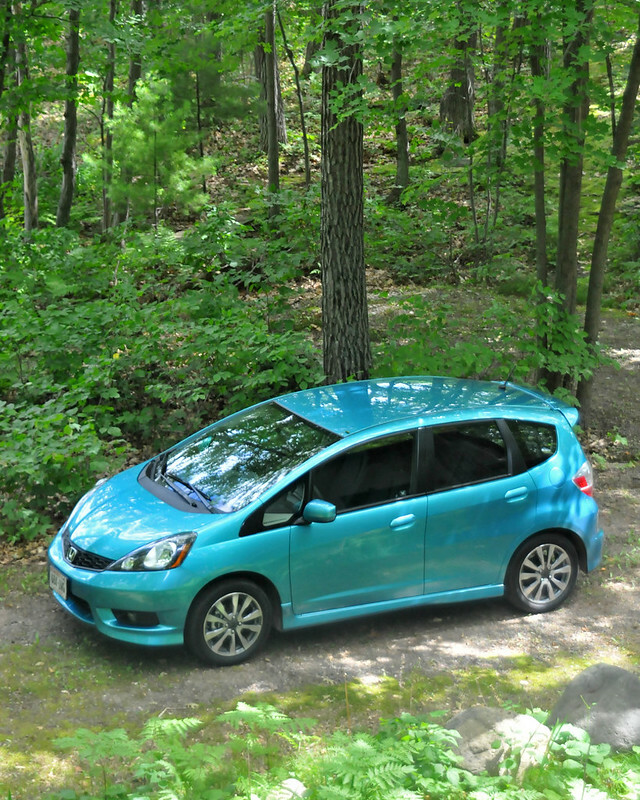 The trip was the first highway venture for our new car, a 2013 Honda Fit Sport. It is rated at 27 MPG City and 33 Highway. During the first week we had it I managed to average just a bit over 30 MPG in almost exclusively city driving. On this trip, we filled the tank as we departed town, and when we arrived at our destination 210 miles away, the handy Average MPG feature of the car informed me that I had managed to coax 39.2 MPG out of it. Yeah baby! That is nearly as good as my motorcycles. The car has a 1.5 liter, 117 horsepower engine. That is essentially the same power as our previous car (2001 VW Beetle) with an engine 25% smaller. I think I will like this car. I am back to job hunting today, but feel pretty relaxed and ready to roll with whatever comes. I am working with a consulting firm, the same one that landed me at the last job, and hopefully have an interview this week with a company that sounds like it might be a good fit. So my fingers are crossed for luck, and my suit is pressed and ready. Wish me luck!